RD Sharma (2017) Solutions for Class 9 Math Chapter 2 Exponents Of Real Numbers are provided here with simple step-by-step explanations. These solutions for Exponents Of Real Numbers are extremely popular among class 9 students for Math Exponents Of Real Numbers Solutions come handy for quickly completing your homework and preparing for exams. All questions and answers from the RD Sharma (2017) Book of class 9 Math Chapter 2 are provided here for you for free. You will also love the ad-free experience on Meritnation’s RD Sharma (2017) Solutions. All RD Sharma (2017) Solutions for class 9 Math are prepared by experts and are 100% accurate. Put the values in the expression aa+bb. Put the values in the expression ab+ba. Put the values in the expression a+bab. Left hand side is equal to right hand side. Left hand side is not equal to one. Disclaimer: The question given in the book is not correct, the left hand side can not be equal to the right hand side. Therefore left hand side is equal to the right hand side. Hence proved. If abc = 1, show that 11+a+b-1+11+b+c-1+11+c+a-1=1. If 49392=a4b2c3, find the values of a, b and c, where a, b and c are different positive primes. It can be observed that 49392 can be written as 24×32×73, where 2, 3 and 7 are positive primes. If 1176=2a3b7c, find a, b and c.
It can be observed that 1176 can be written as 23×31×72. Hence, a = 3, b = 1 and c = 2. First find out the prime factorisation of 4725. It can be observed that 4725 can be written as 33×52×71. Hence, a = 3, b = 2 and c = 1. Hence, the value of 2-a3b7c is 638. If a=xyp-1,b=xyq-1 and c=xyr-1, prove that aq-rbr-pcp-q=1. It is given that a=xyp-1,b=xyq-1 and c=xyr-1. Hence the simplified value of is . If 27x =93x, find x. If 34x=81-1 and 101y=0.0001, find the value of 2-x+4y. It is given that 34x=81-1 and 101y=0.0001. Therefore, the value of 2-x+4y is 21+4-14=20=1. If 53x=125 and 10y=0.001, find x and y. It is given that 53x=125 and 10y=0.001. Hence, the values of x and y are 1 and −3, respectively. If a and b are distinct primes such that a6b-43=axb2y, find x and y. (i) a-1b2a2b-47÷a3b-5a-2b3=axby, find x and y. (ii) a+b-1a-1+b-1=axby, find x + y + 2. Therefore, the value of x + y + 2 is −1 −1 + 2 = 0. If 2x×3y×5z=2160, find x , y and z. Hence, compute the value of 3x×2-y×5-z. First, find out the prime factorisation of 2160. It can be observed that 2160 can be written as 24×33×51. Therefore, the value of 3x×2-y×5-z is 34×2-3×5-1=81×18×15=8140. If 1176=2a×3b×7c, find the values of a, b and c. Hence, compute the value of 2a×3b×7-c as a fraction. First find the prime factorisation of 1176. So, a = 3, b = 1 and c = 2. (i) If a=xm+nyl, b=xn+lym and c=xl+myn, prove that am-nbn-lcl-m=1. (ii) If x=am+n, y=an+l and z=al+m, prove that xmynzl=xnylzm. Write 625-1/4 in decimal form. State the product law of exponents. Thus the exponent "product rule" tells us that, when multiplying two powers that have the same base, we can add the exponents. State the quotient law of exponents. State the power law of exponents. 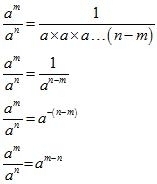 The "power rule" tell us that to raise a power to a power, just multiply the exponents. Hence the value of expression is . Write the value of 5(81/3+271/3)31/4. If (x − 1)3 = 8, What is the value of (x + 1)2 ? Hence the value of is . If 24 × 42 =16x, then find the value of x. Hence the value of x is . If 3x-1 = 9 and 4y+2 = 64, what is the value of xy ? Write the value of 73×493. Write 19-1/2×(64)-1/3 as a rational number. Hence the value of the value of is . Write the value of 125×273. Hence the correct choice is . Hence the correct alternative is . We have to find the value of . Which of the following is (are) not equal to 561/5-1/6 ? If 8x+1 = 64 , what is the value of 32x+1 ? If o <y <x, which statement must be true? We have to find which statement must be true? If 10x = 64, what is the value of 10x2+1 ? For , we have to find the value of x. If g = t2/3+4t-1/2, What is the value of g when t = 64? Which one of the following is not equal to 83-1/2 ? Which one of the following is not equal to 1009-3/2 ? Since, is equal to , , . We have to find the value of when a, b, c are positive real numbers. Hence the correct statement is . On comparing LHS and RHS we get, p - n = 4. So, option (a) is the correct answer. Hence correct choice is .